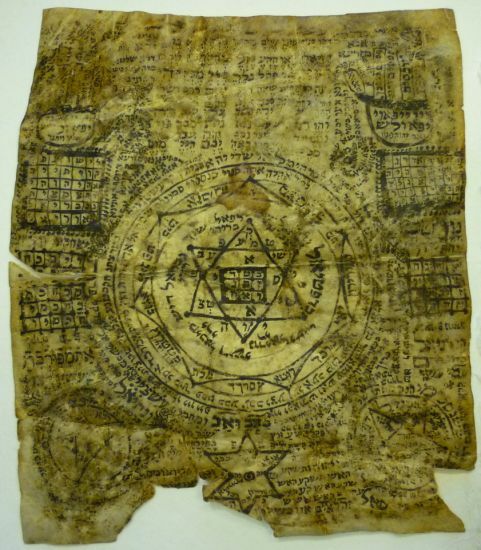 Last December the Museum of Jewish History added to the permanent collection a parchment containing a cabalistic amulet intended as a protection against sore eyes. This object originates from central Europe and dates from the late 18th century. It bears a series of inscriptions in Hebrew of a symbolic and cabalistic nature, calling on the protection of God and of the angels through the invocation of their names. It was probably used on difficult occasions (such as childbirth, for example) when the need was felt for protection and signs of good fortune. This parchment can now be admired in the exhibition case in the room devoted to cultural matters and the cabala, on the Museum's second floor.